Those 1930s sci-fi serials such as “Flash Gordon,” “Buck Rogers,” and “Commando Cody” really were something, weren’t they? The sprawling intergalactic adventures! The lurid cosmic romances! The massive therapy bills? Nobody ever stopped to think what sort of psychological impact all that deep-space derring-do might have on poor old Flash. 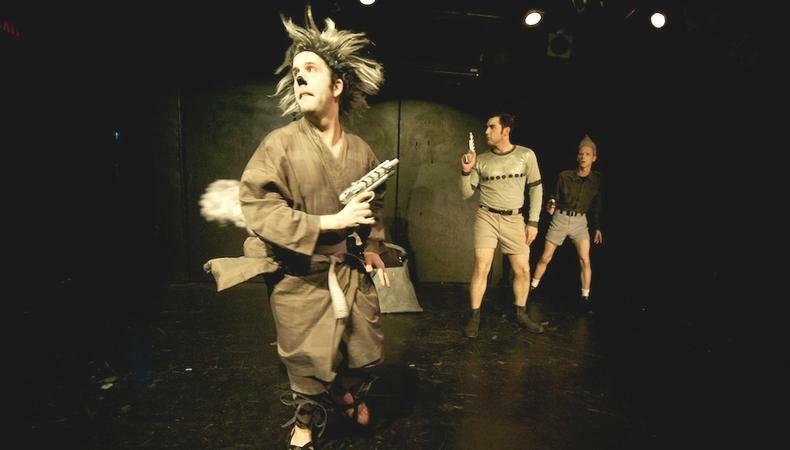 Nobody until Jeff Sproul, that is, whose campy play “Space Captain: Captain of Space!” employs hokey video effects and a bombastic style to lovingly lampoon the space-opera genre, with a bit of 21st-century pop psychology sprinkled in for good measure. Rocky Lazer (Matthew Wise) is your typical alpha-male astronaut-in-action, accompanied by an ever-imperiled sidekick named Chip Skipper (Jeremy Mather), a fainthearted paramour professor called Jean Jarvis (Alicia Barnatchez), and a shifty-eyed scientist labeled Dr. Horst Karlock (Jared Warner). They’re off to planet Argor in their neato X-1 rocket to stop the malevolent King Xayno—who Sproul plays with delightful exasperation—from slamming the moon into the earth with an anti-gravity ray. Yet Wise’s Rocky is really a jerk. He’s a cocky old-school Hollywood hero, complete with a singsong George Reeves affect, who’s only ever been good at punching out alien villains and winning over girls. A rebuff from Jean sends Rocky into an uncharacteristic downward spiral of depression and self-doubt so overwhelming that he finds himself frequenting space oracle Lady Actulus (Sabrina Farhi) for counseling. When the sage Actulus says that Rocky needs to heed the insights of others, he petulantly replies, “I hate those things. Can’t I just be amazing?” Even Jean, ever the victim of era-appropriate misogyny, begins to unravel the purpose of her role as “the damsel,” and Barnatchez renders her journey into amusingly anachronistic feminism very well. It’s a nifty trick to look back at the way we used to portray the distant future and find it quaint. Sproul’s feisty play, snappily directed by Lindsey Moore Sproul, divides its time well between stage and screen. The video segments, cunningly designed and produced by Mather, are all in black and white, as are the live-action components: Each cast member’s face has been caked with heavy white powder. If anything, the whimsical, very funny script commits itself too much to the conceits of the serial format. Each “Chapter” is preceded by a rolling-text introduction that will instantly call to mind the film “Star Wars” (“Star Wars” creator George Lucas has always admitted a stylistic debt to the sci-fi yarns of the 1930s). Unfortunately, the shtick wears itself out by the time “Chapter 5” rolls around. The evening’s purest laughs come from the hobby-kit-spaceship battles enacted onstage with models Sproul designed himself and from the lively cast. Michelle McNally and Matt Sears are particularly hilarious as Astra, King Xayno’s moody daughter, and Klarff, the jittery prince of a race of squirrel men. Presented by No Tea Productions at the Kraine Theater, 85 E. Fourth St., NYC. Aug. 30–Sept. 15. Thu–Sat., 8 p.m. (No performance Sat., Sept. 8.) (800) 838-3006 or www.brownpapertickets.com.